Of course, your roof is designed to withstand the elements. Some roofing materials are even designed to last more than 50 years! However, this doesn’t mean that your roof won’t eventually meet its match when it comes to sustaining storm damage. Some storms are more intense than others. Here are some ways to tell if your roof has storm damage. Before we begin, we want to remind you to be safe when checking your roof for signs of storm damage. Do not attempt to go on the roof if the storm is ongoing or if there are still heavy winds. Choosing to view your roof from the ground with binoculars is a helpful strategy. If you are at all unsure about your ability to survey your roof, call a professional. E3 even offers a free roof inspection, so take advantage of that! 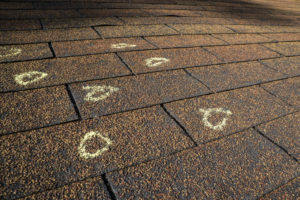 Most hail damage on a roof will look like what you might expect – pock marks or indentations. However, it can sometimes be easy to miss if you don’t know what you’re looking for. To check your roof for hail damage, begin by surveying the entire area for dents. Make sure to check metal vents, flashing, gutters, and downspouts. Pay special attention to the ridge cap (the peak of the roof where the two slopes meet), as this area usually sustains the most damage. Shingles can also show signs of hail damage. Hail can bruise a shingle causing an indentation, which can crack and allow water to leak under the roof over time. Look for any dents or cracks in the shingles or missing pieces of asphalt. Dents from hail are not always obvious or visible (like the photo above). Run your hand over the shingle to feel for dimples in the surface. If the shingles are damaged, there will sometimes be a large pile of granules at the end of your downspout where the rain has washed them away. If you notice damage in other parts of your property or on your vehicles, it is likely that your roof sustained hail damage as well. The most obvious sign of roof damage from strong winds is missing shingles. Missing shingles can lead to leaks or other interior damage. 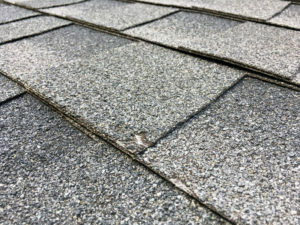 Check the shingles for thin horizontal lines where granules have been worn off about 1-2 inches beneath the shingle above. This could indicate that the shingle seal has been broken and the shingle was flapping in the wind, rubbing the shingle above it. Other wind damage may not be so obvious, especially if the adhesive seal that provides a water-shedding surface is broken. Having the help of a local roofer for a roof inspection could help make sure no signs of roof damage from wind have been missed. 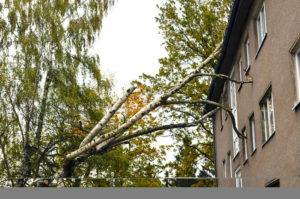 Some storms can cause tree branches or other debris to damage your roof, especially if you live in a wooded area. Check your roof for missing or cracked shingles, dented flashing or vents, and a large pile of granules at the end of your downspout. Sometimes, this damage can be quite obvious, but sometimes you may need the help of a roofing contractor to inspect your roof for damage. In most cases, if you find roof damage from a storm, you will need to file an insurance claim. The easiest way to do this is to find a trusted local roofing contractor who has experience in this area. If a storm comes through your area and you suspect damage, contact E3. We’ll send an insurance restoration specialist out to conduct a free, no-obligation inspection to identify any damage. Then we’ll negotiate with the insurance company on your behalf, addressing items such as damages, measurements, and dollar amounts. E3 Roofing & Remodeling will even be there for you during your adjuster meeting! Roof damage after a storm is nothing anyone wants to deal with, but with E3, you don’t have to do it alone! Give us a call today to schedule your inspection.